Chapter 18: The Amir sets out for Greece, and contracts a marriage with Nahid Maryam, a charming beauty. EIGHTEEN — The Amir sets out for Greece, and contracts a marriage with Nahid Maryam, a charming beauty. The expedition to chastise the supposedly rebellious kings was beset with difficulties. The worst of these was the faithless Qarin, who tried by every means to cause Hamzah’s death. Early in the trip he promised to show them a shortcut, which then turned out to lead through a bone-dry desert. After guiding the party into the desert until they were almost dying of thirst, Qarin offered Hamzah some water–which he had poisoned. But since there was not enough for everyone, Hamzah refused to drink alone. Nor would Landhaur, nor ‘Adi, nor Muqbil, and so they all escaped. ‘Amar, with Khizr’s help, found a stream from which they could drink. Later, Qarin tried poisoning a whole river, but the suspicious appearance of the water gave the plan away, and Hamzah’s party dug their own ponds. Qarin tried to incite all the kings along their line of march to kill Hamzah. At his instigation one king, a pretended convert to Islam, built a bath-house which was designed to collapse on Hamzah and kill him, but ‘Amar caused it to collapse prematurely on the villain himself. After a series of such narrow escapes, Hamzah and his party captured Qarin. Hoping to save his life, Qarin presented Hamzah with many valuables, including an armband set with twelve huge night-glowing rubies. But his gifts were in vain; ‘Amar later killed him in captivity. After a time Hamzah and his party arrived in Greece. The adorners of composition clothe the brides of Meaning in jewels of language, and decorate the beauty of expression in various new ways: When the beloved one Victory showed her radiant glory in the mirror of the Amir’s heart, the Amir entered the fort of #Aleppo and ordered a week of celebration. Writing all about the tribute and submission of the five lands, and the story of Qarin, and other happenings, he sent a letter with Muqbil to be presented to Naushervan, and himself set out for Greece. After some days, he crossed the border into Greece and encamped there. King *Faredun, the king of Greece, already knew about the Amir’s doings from the reports of his news-writers. As soon as he heard of the Amir’s coming, he set out from Greece with substantial offerings, taking his brothers along. On the road he met the Amir, presented his offerings, and with a sincere heart paid reverence to him. With pure intentions he recited the profession of faith and, along with his brothers, was ennobled by Islam. The Amir was entirely happy with his merit and worthiness, and dignified him and his brothers with resplendent robes of honor, and arranged a celebration. For some days, in this rustic setting, the revels continued. When the Moor of the Night had been defeated by the King of the Day, and the King of the East had put to flight the army of the stars, the Sahib-qiran, taking King Faredun with him, set out to kill the serpent; various ones among his faithful and devoted servants also went along. And the King of Hind, taking along with his army Asif, the brother of King Faredun, went forth against the Moor. When they came within nine miles of the serpent’s lair, King Faredun got down from his horse and begged, “Just look around–except for burnt stumps, there’s not the slightest sign of a tree to be seen anywhere. The whole mountain and forest have become black ash. When that foul creature awakes from its stupor and blows out its breath and hisses, the flames of fire reach all the way here! Right now it’s sleeping contentedly. Otherwise even animals and birds, not to speak of men, couldn’t possibly stay in this place; a bird couldn’t even stir a feather.” The Amir also got down; taking ‘Amar with him, he advanced toward the serpent. King Faredun too accompanied them. When they drew near, they saw something like a small black hill. When they went nearer, they realized that this was the serpent. The Amir said, “To kill a sleeper is no act of courage! This is only a foul worm.” Giving a battle-cry, he woke it. When it saw the Amir, it raised a neck the size of a palm tree and, hissing, advanced on him. The half-dead trees ahead of it were dried out and burnt by the flames from its mouth; some of them were seared into charcoal. When the Amir, fitting a double-headed arrow into his bow, released it, both the creature’s eyes became nests for the arrowhead-birds, and it began to bang its head on the ground. The Amir, going in close to its side, struck a blow with the serpent-killing sword, and made the hill into two hills; then it could no longer move. King Faredun ran to kiss the Amir’s hand and arm; he repeatedly walked around the Amir and made the #gesture of warding off evil from the Amir onto himself. The Amir mounted and rode to the fort. He had just entered it when Landhaur arrived, bearing the head of the blacked-faced Moor, and offered the treasure which he had brought from that fortress in the Amir’s service. King Faredun gave away the gold and jewels in charity for the sake of the Amir and Landhaur, and arranged for festivities to be held. A lively, luxurious, joyous party took place. ‘Amar, giving him many reassurances, said, “Why, this is a small matter! The wedding ceremony will be held this very day. I take full responsibility, don’t you be anxious. Please quietly prepare for the wedding.” With these words, he took the gold pieces and went to his own quarters. 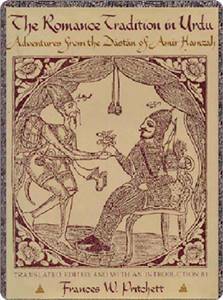 ‘Amar was a greedy fellow, after all; he gave King Faredun a great deal of encouragement! Afterwards he praised Nahid Maryam’s beauty so lavishly that the Amir grew impassioned. The next night was the night to put on the henna; after performing the henna-ceremony the Amir married Nahid Maryam, and for two weeks remained absorbed in enjoyment and pleasure with her. Celebrations went on continually. On the sixteenth day, having given Nahid Maryam one of those twelve rubies which he had obtained from Qarin, he came out of the palace. Those who were longing for a fortunate glimpse of him, and who for so many days had not been ennobled by attending upon him, were boundlessly happy. Taking tribute from King Faredun, and adding the wealth of Shankavah the Moor, he sent it with Landhaur in Naushervan’s service. He sent ‘Amar too along with Landhaur. And he ordered his vanguard to set out for Egypt.